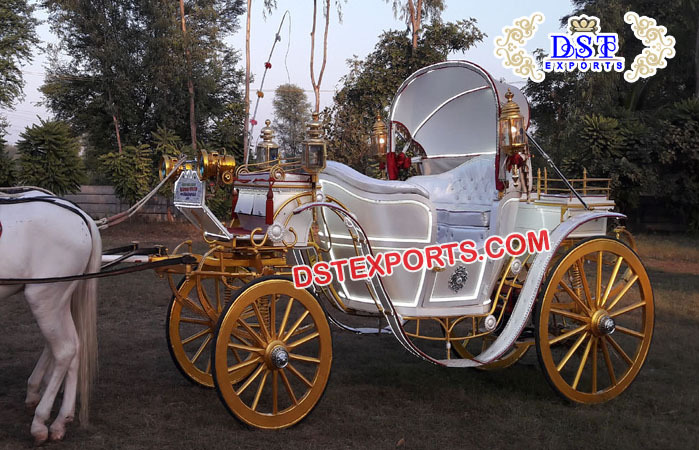 DSTEXPORTS are best manufacturer and exporter of all horse-drawn carriages manufacturer such as Air Condition Fitted Horse Drawn Buggy, Tourist Long Horse Drawn Buggy Carriage, Stylish Victoria Touring Horse Buggy Vehicle, Royal Black Horse Drawn Buggy Carriage, Royal Presidential Horse Buggy Carriage Ruth, Traditional Indian Black Buggy Carriages, Black Victoria Buggy Carriages Maker, Museum Horse Drawn Carriage, Vis a Vis Carriage, Small Victorian Style Carriage, Maharaja Horse Drawn Buggy Carriage For Sale, Elegance Wedding Victorian Horse Drawn Carriage etc. We also supplied Horse Carriage Decorations and accessories such as horse costume, horse belts, carriages lamps etc so please feel free to contact us and give us chance to serve you the best. These carriages are available as two-seaters, three-seaters, four-seater, five-seaters, depending on the clients' requirement. These carriages are totally handmade and very strong for long life. Chase or body of the carriage is made of ms steel fabrication. Excel Shafts are ms steel and fitted with bearings. Steering is very soft moving like power Steering of cars and made of wood and steel. Wheels are wooden with steel rims with rubber. Top body is made of treated wood. Seats are very beautifully furnished with leather foam and crystals. The logo of this carriage is very beautiful and attractive. We have a vast variety of logo... available in all sizes, designs, colors, and shapes. this carriage is totally folded and flexible. Sometimes the weather is not good, you can open this carriage to escape yourself. We can use this for multipurpose include:- entrance of weddings, stage decoration, events, anniversary etc. This carriage has presidential look.